Many of you know and have met some of my friends from home and know how close we all are. In high school, we called ourselves a 'family' and it's still true to this day, no matter how far or the time difference. Unfortunately, this past summer we learned that one of our friends, Heather was diagnosed with brain cancer. This email was sent to me by my friend Ali Boone. Her words described one of our best friend, Heather's battle with brain cancer. On Sunday June 16th, a very good friend of mine, Heather Pater, visited the hospital after experiencing what she thought was merely a fainting episode. Once doctors had discovered that what had actually occurred was a seizure, they decided run some tests and do a CT scan. Results from the CT scan revealed that she had a tumor a quarter the size of her brain in her frontal lobe. Due to the magnitude of its size, the tumor was estimated to have been growing over the course of seven years. Several days after the operation to remove the tumor, she was informed that she was being diagnosed with Stage 3 and 4 brain cancer. Parts of the tumor are still in her frontal lobe, but doctors are remain hopeful. She began her aggressive six-week radiation and chemotherapy treatment this past week. I am emailing you all to reach out for your support as Heather and her family go through this difficult time. As I’m sure you know, the cost of medical bills on top of supporting a family of five can be extremely difficult. Heather has been chosen as a recipient of a fundraiser for a non-profit organization, For the Love of Donna, which began in 2005 in commemoration to Donna Muthersbaugh, a woman who died far too young battling Non-Hodgkins Lymphoma. Her wish was that her family continue to raise cancer awareness and help families struggling financially. Although you may not know Heather, she is the most kind, dependable, and sincere friend. Her positive outlook, sense of humor, incredible courage and willpower throughout this whole experience has continued to remain a constant inspiration to all friends and family around her. Her and her family would greatly appreciate your kindness and generosity by clicking to the link below and donating to her foundation. Any amount no matter how small counts! And of course if you are not able to donate, your thoughts and prayers are more than appreciated. Another friend, Chelsea, has gone above and beyond and created wristbands to raise money for Heather. If you are interested in purchasing a wristband and donating to a worthy cause for an extremely special individual please contact Chelsea! They are a $4 donation ($3 plus necessary postage) and she is more than willing to mail directly to your personal address. Easy transfer through PayPal, and the profit will go directly to the Heather Pater Foundation. 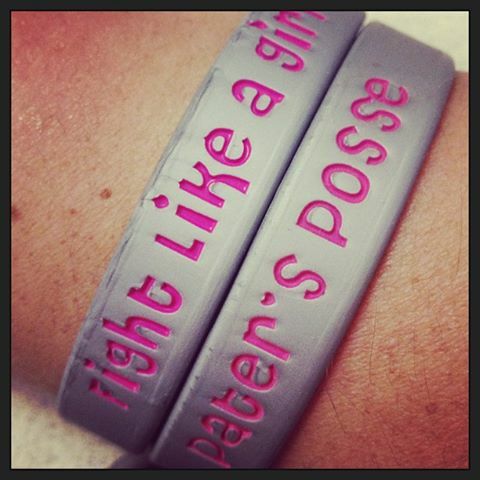 Please help support Heather fight like a girl! We love you Heath!! I am touched deeply with your friend's story battling cancer. It saddens me, as she is a young woman, who under other circumstances, could and should be having the time of her life. There are times, when we wonder why these things happen and why people who are good by nature and caring, have to suffer in such a way. I have lost many dear and loved ones to cancer, one of them was my father and my husband died about 4 years ago. I pray for your friend to recover. Thank you for posting. BTW I also live in Brugge.